Become a GoCatch Driver today. Signup as a GoCatch Driver and earn on your schedule. You determine the hours, and you’re in control. Driving for GoCatch is fun and rewarding, helping drivers meet their goals. You’ll be earning in no time! With better rates for drivers, twice-weekly payments, Advance Bookings, GoPoints, GoCoins and the Leaderboard, you get a better deal with GoCatch. An easy to use interface, with built-in navigation and the ability to conveniently contact your passenger. View your past trips, account balance, and read about great hotspots to drive around every weekend. Our switched on Support Team is always here to help. Day or night, get in touch with us directly in the app – we're just one tap away. Hold a full, unrestricted Australian Drivers Licence for a minimum period of 12 months. Your Driver Licence must be current and valid. International, Probationary or Learner’s Driver Licences are not permitted. You’ll also be required to have the the correct licence and necessary documentation. Click on your respective state below, as certain requirements can vary. You must have held a full, unrestricted Australian Driver Licence for a minimum period of 12 months. Your Driver Licence must be current and valid. This Driver’s licence must hold a condition called a ‘Passenger Transport Licence Code’. This can be applied by clicking the button below. GoCatch Support can then check this condition from our system, there is no visual evidence needed. International, Probationary or Learner’s Driver Licences are not permitted. National Police Check – you must provide a criminal check that has been issued within the last 3 months. This check may take 1-14 business days depending on the person. Driving Record – you’ll need to send us a copy of your NSW driving record. You can get this online at the RMS website or in person at the nearest Service NSW Office. Please provide a full copy of your valid Third Party Property (Fire and Theft), Third Party Property Damage, or Comprehensive vehicle insurance certificate. CTP is not adequate vehicle insurance. The document must have your name printed as the policy holder or nominated driver, and it must display the vehicle’s registration number, details, type of cover, and a future expiry date. Your vehicle MUST be insured under a Rideshare condition and this must be clearly shown on the document. Note: The document is often called a ‘Certificate of Currency’ or ‘Certificate of Insurance’. All vehicles used to provide point to point transport services must have a safety check (previously called a pink slip) at least once a year. This applies to taxis and hire cars, including rideshare, regardless of vehicle age (that is, even if the vehicle is less than 5 years old). Further information as to vehicle inspections, including certified inspection stations can be found here. You must have held a full, unrestricted Australian Driver Licence for a minimum period of 12 months. Your Driver Licence must be current and valid. International, Probationary or Learner’s Driver Licences are not permitted. GoCatch is working closely with the Taxi Services Commission to assist with the ongoing rollout of the new transportation framework. As such, we require every driver with GoCatch to hold an appropriate and valid Driver Accreditation. For more information, click here. Otherwise, please complete an application for Driver Accreditation, organise an appointment with your General Practitioner and submit your application to the Taxi Services Commission. Note: a current and valid Taxi Driver Accreditation is also accepted. It is a condition of Commercial Passenger Vehicle Registration that the vehicle have passed a roadworthy vehicle inspection. Further information as about obtaining Commercial Passenger Vehicle Registration can be found here. Certified Roadworthy Testing locations in Victoria can be found here. Please complete a Driver Authorisation Application (includes the Private and Commercial Vehicle Driver’s Health Assessment form), organise an appointment with your General Practitioner and submit your application in person at a transport and motoring service centre. Note: General, Booked Hire/Taxi, or Taxi Driver Authorisations are currently accepted by GoCatch. From 15 January 2018, all Economy drivers in Queensland will be required to carry a booked hire service licence (BHSL). You will need to apply for a BHSL to drive as an Economy driver. The Queensland Department of Transport and Main Roads requires all ride-booking drivers to obtain a current vehicle safety certificate, issued by an Approved Inspection Station. Drivers are required to maintain this certificate in their vehicle at all times when providing ride-booking services and are expected to provide evidence of it when requested by a Transport Inspector. Note: Certificates are valid for 12 months. Each registered vehicle on the GoCatch platform must have its own certificate. For more information, visit this website. Your Driver Accreditation will need to be renewed every 3 years. Before you can apply for driver accreditation you must have a valid child-related employment screening clearance issued through the Department of Communities and Social Inclusion (DCSI). An application for driver accreditation is required to confirm that the driver does not suffer any physical or mental incapacity that would impair their ability to work effectively as the driver of a public vehicle. You will need to complete the MR713 application, driver accreditation application form and MR1581 driver accreditation declaration form. It is a condition in South Australia, that vehicles providing rideshare services, have been certified at approved vehicle inspection stations, prior to commencing trips, as well as Annually to ensure ongoing Vehicle Safety. Approved inspection stations can be found here. For more information, visit this website. An F extension, also known as a bus driver’s licence or charter vehicle licence, allows a driver to carry passengers for hire or reward, regardless of the number of seats fitted. An F extension is not required if you have held a T (taxi) extension and have held a Driver’s Licence for 4 years in WA. This licence is an extension of your existing driver’s licence. You must also have the relevant licence for the class of vehicle you will be driving. You will need to complete an application form, police check, undertake an eyesight and medical checkup, and pay the required fees. You will also need to complete an F/T extension application (Form DL1), NPC National Police Certificate, Proof of Identity Requirements and a Medical assessment certificate: Fitness to drive (Form M107A). It is a condition in Western Australia, that vehicles providing rideshare services, have been certified at approved vehicle inspection stations, prior to commencing trips, as well as Annually to ensure ongoing Vehicle Safety. Approved inspection stations can be found here. All GoCatch drivers in the Northern Territory must hold a current and valid Commercial Passenger Vehicle ID (CPVID) and H Endorsement on their driver’s licence. You’ll need to complete an application and submit supporting documents to the Northern Territory government to obtain these documents. All vehicles on the GoCatch platform must have a Commercial Vehicle Licence (CVL) and CVL sticker displayed. You will need to complete and pass a vehicle inspection to obtain these. As soon as you have obtained your vehicle inspection report, you'll need to submit your application for a Commercial Vehicle Licence (CVL) to the Northern Territory Government. As part of your application for a Commercial Passenger Vehicle ID and H Endorsement, you'll need to complete a hire and reward knowledge theory test relating to commercial passenger vehicle requirements at any MVR Office, provide a current medical assessment supplied by a medical practitioner, passed a preliminary CPV driving assessment (if your driving experience is less than two years) and obtain a National Police Certificate (NPC) and ABN. You'll submit these supporting documents when you apply. You'll need to complete the application form provided below and submit it with your supporting documents and applicable application fee to the Northern Territory Government. It may take up to a week to receive your CPVID. Once you receive your CPVID to your mailing address, you'll need to upload a clear photo of it to your GoCatch account. To apply for a CVL, you'll need to complete a vehicle inspection first. Click the link below to browse a list of inspection locations. To apply for a Commercial Vehicle Licence, your vehicle must have passed a vehicle inspection and be registered accordingly. Click the link provided below to complete and submit the application form. Once you’ve received your CVL, upload it to your GoCatch account. 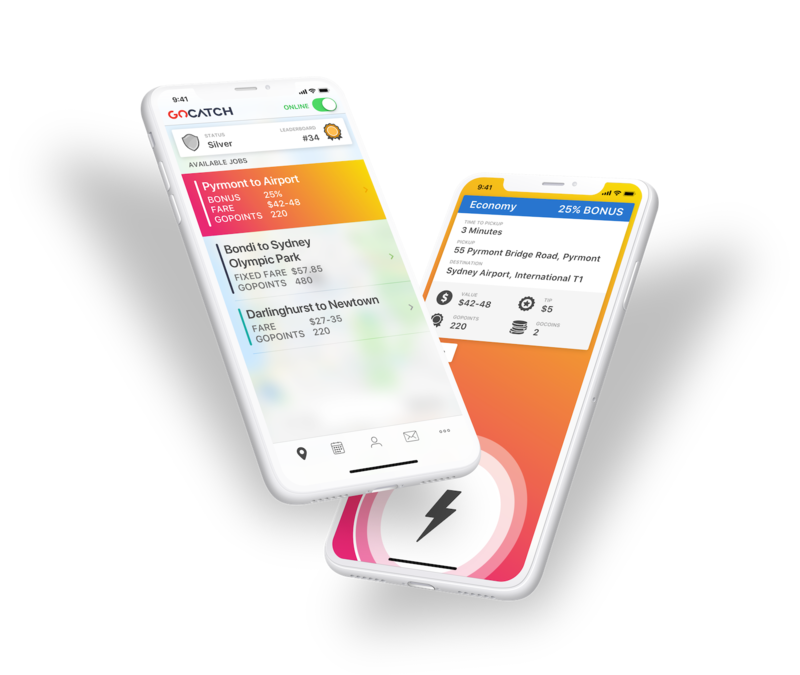 You'll also receive an accompanying CVL sticker, which you must legibly display on your vehicle when driving using the GoCatch Driver app at all times. For an overview of the accreditation required to undertake rideshare services as a driver in Tasmania, click here. Ride sourcing Drivers in Tasmania are required to hold an Ancillary certificate with an X-condition, and comply with all conditions and requirements of the Transport Commission exemption. Further, ride-sourcing vehicles must have undergone a vehicle inspection within the last 12 months. For further information as to Ancillary certification, click here. It is a condition in Tasmania that vehicles providing rideshare services hold a vehicle inspection certificate that is less than one year old. Drivers must hold a type 2 AIS vehicle inspection report from approved stations, as can be found here. Note: If you have not yet obtained your Ancillary Certificate for conducting rideshare, a type 2 AIS vehicle inspection report that is less than 30 days old must be included as part of your application for Ancillary Certification. For more information, visit this website. All drivers are required to meet the new regulatory requirements set out under the Road Transport (Public Passenger Services) Regulation 2002 and the Road Transport (Driver Licensing) Regulation 2000. From 8 November 2017 public vehicle driver licence holders will be required to hold a working with vulnerable people registration under the Working with Vulnerable People (Background Checking) Act 2011. A completed ‘Commercial driver’s health assessment’. It is a condition in the ACT, that vehicles providing rideshare services, have been certified at approved vehicle inspection stations, prior to commencing trips, as well as Annually to ensure ongoing Vehicle Safety. Roadworthy Inspection certificates may obtained from authorised vehicle inspection stations, as can be found here. Find out if your vehicle is eligible for GoCatch by clicking on Eligible Vehicles below. If you are unsure if your vehicle meets our minimum requirements, or isn’t on the list below, get in touch with us at support@gocatch.com with the vehicle make, model and year. Premium class includes HC-plated vehicles and high-end, luxury vehicles. If your vehicle is eligible for Premium, you will be able to accept both Economy & Premium job requests. Vehicle Identification Signage is mandatory for GoCatch drivers in NSW and QLD. Signage is to be placed on the front and rear windscreens. Pack includes 2 signs and 2 adhesive sleeves. For new drivers in NSW and QLD, a $9.00 (inc. GST) charge is automatically deducted from your account upon signup and a pack is sent out to your provided address within 5 business days. Waiting for your signage pack to arrive? You can also print out a temporary sign to attach to your windscreen. It’s easy to drive and earn on your schedule with GoCatch. But before you get started, you may want to know how much you can make as a driver. Click below to learn more about fares and peak hours. Every fare paid through GoCatch comes with the GoCatch Driver Payment Guarantee. This means you don’t have to worry about losing money due to passenger fraud or insufficient funds. GoCatch guarantees that each fare amount less any applicable fees or charges will be paid into your bank account weekly. T&C’s: Applies to all trips with electronic payment made through GoCatch. Excludes cash jobs. Ensure your bank account details are entered correctly on your account. GoCatch Driver Payment Guarantee does not apply if you breach the GoCatch Terms of Service. Firstly, click the sign up button to create your driver profile. Then, upload the required documentation. After sign up, you’ll need to download the GoCatch Driver app from the App Store or Google Play. Once you've uploaded all your documentation, wait for your account to be approved by the GoCatch Support Team. Once approved, you'll be able to go online and accept on-demand jobs and Advance Bookings.